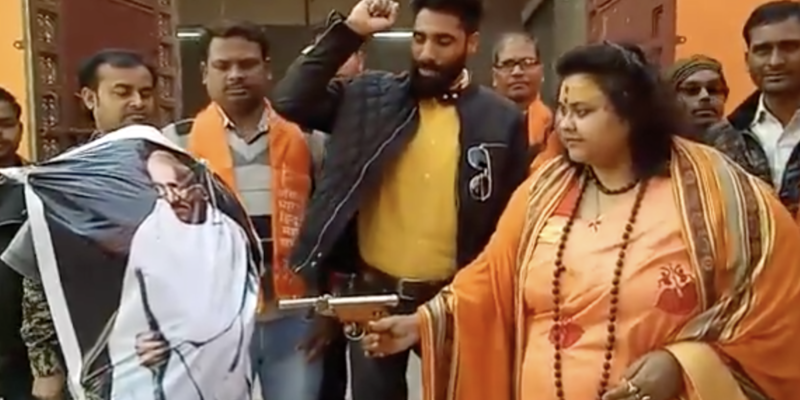 Pooja Shakun Pandey, leader of the Mahasabha, shooting an effigy of Mahatma Gandhi. The better known victims of this hate include Mohammed Akhlaq who was beaten to death in Dadri on the mere rumour of possessing beef, Pehlu Khan who was lynched by a mob in Alwar, young Junaid who was stabbed to death on a train simply for being a Muslim, and Mohammad Afrazul, who was hacked to death and then burned by Shambhulal Regar. There have been several others as well. 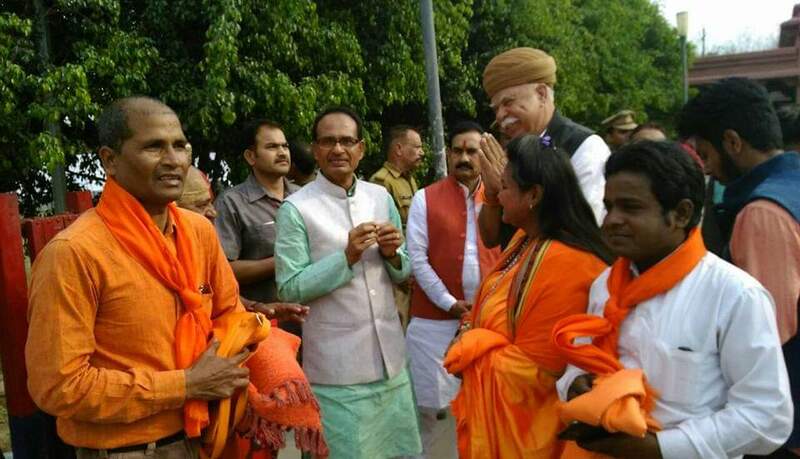 Undated file photo of Pandey with BJP leader and former Madhya Pradesh chief minister Shivraj Singh Chouhan. Murderers have been garlanded and the families of the victims have had to face police action. 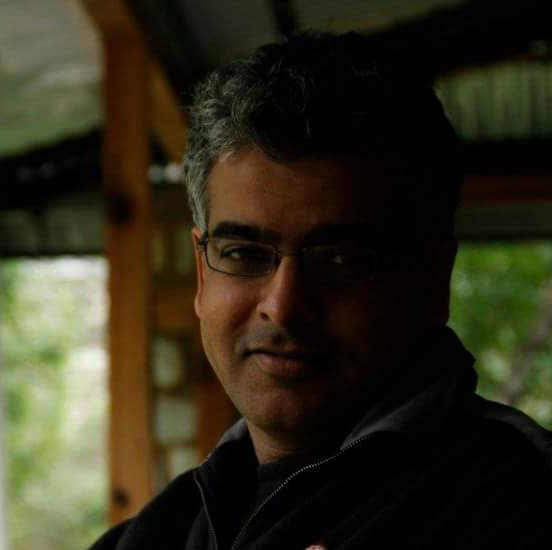 Journalists, NGOs and activists who have spoken out against the rising tide of hate have faced harassment, legal suits and even imprisonment. The great Hindutva project – which began before India gained independence and received a great push forward with the destruction of the Babri Masjid in 1992 – entered its golden (saffron?) era with the coronation of its very own Hindu Hriday Samrat in 2014. This is Hindutva’s heyday. The RSS reigns supreme. Gandhi has officially been co-opted and reduced to a pair of glasses and a broom, so why so much hatred for a man who is dead, and for all practical purposes gone from the body politic? It looks like hate, but could it actually be fear? Behavioural psychologists will tell you that hatred and fear are two sides of the same coin. One follows the other, as night follows dusk. Could it be that the spirit of the Mahatma is alive and well, walking the streets and alleys of India? Satya and ahimsa, as we know, were the ‘weapons’ with which he waged his ‘war’. Is it possible that over the past five years, every time the Hindutva organisations and leaders have seen those two most powerful of all ‘weapons’ in action, they have also seen the spectre of Gandhi? Also read: Why Was Mahatma Gandhi Killed? For instance, did they see his silhouette in March 2018, when 55,000 farmers marched into Mumbai to press for their rights, but did so at night so as not to disturb the school children who were to give their Board exams the next morning? Did the RSS and its acolytes sense Gandhi’s presence when thousands upon thousands of citizens in each of India’s metro cities came out under the banner of “Not In My Name” to protest the murder of young Junaid – whom they did not even know – a boy whose only “crime” was that he was a Muslim returning home from Eid shopping? Did the adherents of Hindutva see Gandhi weep when Rohith Vemula committed suicide, when Najeeb went missing from JNU? “By affirming that he bore Muslims no ill will, Yashpal Saxena, whose only son Ankit Saxena was murdered by the family of the Muslim girl he loved, demolished one of the most widely used rationalisations for communal hatred. He rejected what I call the Doctrine of Vicarious Guilt, the idea that an entire community must collectively carry the guilt for crimes – real or imagined, committed now or in history – which any of its members may have perpetrated.” – Exactly what the Mahatma taught.